It begins as a system of beautiful, bioluminescent patches floating along ocean currents. But its beauty brings laughter. And the laughter brings madness. A schizophrenic narcissist on an ocean cruise, a college student called home to settle her uncle’s estate, and the head of a Houston survivalist group find themselves caught up in the outbreak of the disease known as Kampala Syndrome. Will any of them survive the heart-pounding battle for survival in a world gone insane? Buy Chucklers – Volume 1: Laughter is Contagious in trade paperback. 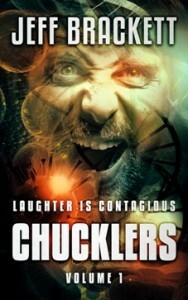 Buy Chucklers – Volume 1: Laughter is Contagious for Kindle.